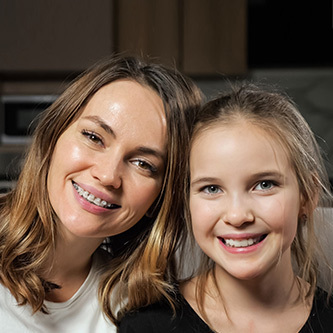 Once all of a child's permanent teeth have erupted (usually between 11-13 years of age), he or she is ready to begin orthodontic treatment with braces! Don't worry! Braces aren't nearly as scary as you may think. In fact, braces today come in a variety of styles, materials, and colors, making life with braces much easier, more comfortable, and even more stylish than in the past. Orthodontic treatment is a big part of life for many young people today and we're here to help make it as enjoyable and rewarding as possible. What needs correction — The amount of movement needed to correct a problem will set the stage for how long the process takes. While it may take one patient only 18 months to complete treatment, it may take another patient with a more severe problem 28 months. Your teeth -- Everyone's teeth react differently to orthodontic treatment. Some people's teeth move very quickly, other's more slowly. How your body responds will play a role in how long your treatment will take. YOU! — Your willingness to cooperate with the instructions your orthodontist gives you plays a major role in the length of time it takes to complete your treatment. Always remember to take care of your braces and appliances; this truly will help make your treatment shorter! Aren't braces just for looks? Many people still believe that braces are just cosmetic and there are no benefits beyond looks--this couldn't be further from the truth! Many orthodontic problems, if not corrected in childhood, can result in significant health issues in adulthood. An improper bite can lead to wearing and chipping of teeth. Crowded teeth are difficult to clean and can contribute to tooth decay and gum disease. These issues require extensive dental treatment that often is more expensive than the orthodontics that can help prevent it. There definitely is an improvement in esthetics after treatment, and the confidence a young person gains from having an attractive smile cannot be underestimated. You can feel good about investing in orthodontic treatment for your child; you're giving them a healthy, beautiful smile that will last a lifetime. Orthodontic treatment is no longer just for teens! In fact, the American Association of Orthodontists reports that one in five orthodontic patients is over the age of 21. Many adults are choosing to receive treatment because they understand the importance of maintaining their health, and they want to feel better about their appearance. Recent studies have even shown career success can be correlated with the attractiveness of your smile! Adults everywhere are taking advantage of the opportunity to receive orthodontic care, and now you can too. Our practice also recognizes that adults and children have different needs, and require a different level of attention and care. We will work with you to ensure that you receive the most appropriate treatment and are comfortable with every step on the path to a beautiful, healthy smile.